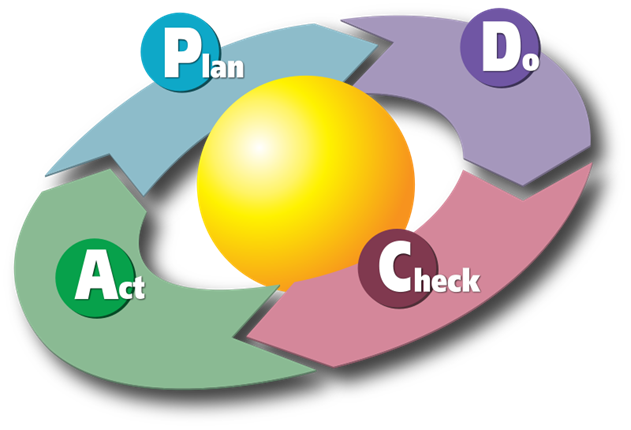 PDCA is an iterative four-step management method used in business for the control and continuous improvement of processes and products. PLAN : Establish the objectives and processes necessary to deliver results in accordance with the expected output (the target or goals). Plan : Identifying and analyzing the problem. DO : Implement the plan, execute the process, make the product. Collect data for charting and analysis in the following "CHECK" and "ACT" steps. Do : Developing and testing a potential solution. CHECK : Study the actual results (measured and collected in "DO" above) and compare against the expected results (targets or goals from the "PLAN") to ascertain any differences. Charting data can make this much easier to see trends over several PDCA cycles and in order to convert the collected data into information. Information is what you need for the next step "ACT". Check : Measuring how effective the test solution was, and analyzing whether it could be improved in any way. 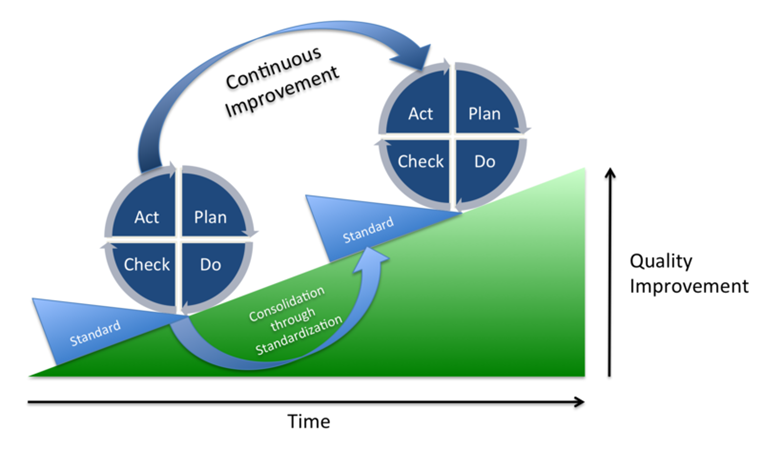 ACT : If the CHECK shows that the PLAN that was implemented in DO is an improvement to the prior standard (baseline), then that becomes the new standard (baseline) for how the organization should ACT going forward (new standards are enACTed). If the CHECK shows that the PLAN that was implemented in DO is not an improvement, then the existing standard (baseline) will remain in place. In either case, if the CHECK showed something different than expected (whether better or worse), then there is some more learning to be done... and that will suggest potential future PDCA cycles. Act : Implementing the improved solution fully.